When the evenings get chilly, an outdoor fireplace or fire pit provides a cozy atmosphere and added warmth. 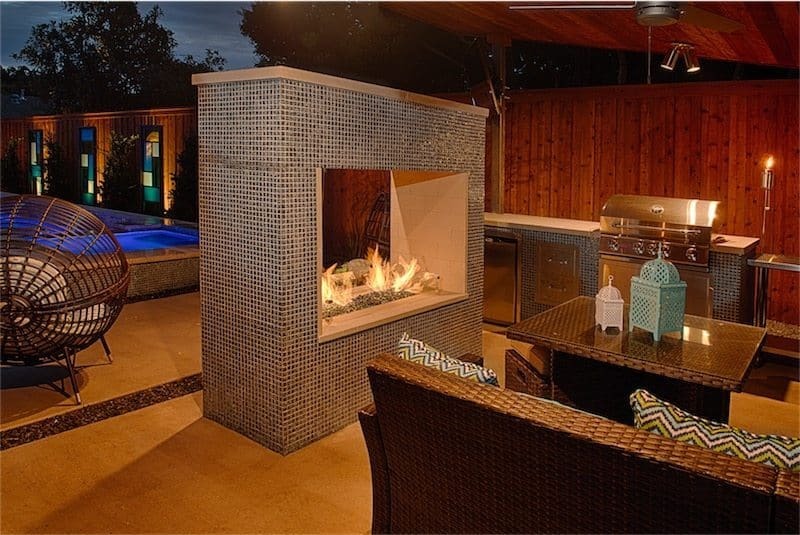 At Summerhill Pools, we offer outdoor fireplaces and firepits to homeowners in the Dallas area. Our experts are here to help you design the right outdoor living space including fireplaces and fire pits to warm up your yard. Let’s get started on creating an extension of your home outdoors – contact us today. When designing your outdoor fireplace, you have a number of different materials and styles to choose from. Whatever the look you prefer and whether or not you want your fireplace to blend in or stand out, you’ll have a variety of options. Outdoor fireplace ideas range from classic brick or stone designs to more elaborate designs, such as three-sided fireplaces that give more guests a chance to sit by the fire. Outdoor fireplaces can be freestanding ones that make a bold impression or ones that are built into a wall to create a more seamless appearance. No matter which style you prefer, our experts can help you come up with an outdoor fireplace design. We can go over your options with you and determine what size you need to make the design process as stress-free as possible. When you’re ready to look into outdoor fireplace options, give our experts at Summerhill Pools a call. We can set up a consultation with you or provide you with any additional information you need about our outdoor fireplace services. Firepits are available in several styles and designs, so you’re bound to find the perfect one for your Dallas home. These outdoor fire features can add warmth to your yard while also enhancing your yard’s appearance. We can design fire pits made from copper for a sleek, shiny look or fire pits made from concrete for a more contemporary look. At Summerhill Pools, we offer fire pit options and designs that range from streamlined to elaborate. Streamlined fire pits tend to have a more rustic look that blends in well with the surrounding area. Those with more elaborate designs typically have a more elegant appearance, which can make them stand out among the landscape. If you’re not sure which firepit would look best in your yard, our Summerhill Pools professionals can provide you with guidance. When choosing a fire pit, there are also many other options to consider, such as whether you want an automated or manual operation, the size of fire pit you need to adequately warm up multiple people, and whether you want your fire pit to work with natural gas, propane, or wood. Our experts can help you weigh your options and design the most suitable fire pit for your Dallas property. When you need an outdoor fireplace and fire pit contractor in Dallas, TX that you can depend on, you can trust Summerhill Pools. When you have selected the fireplace or fire pit design that you want, our team will handle the installation process and ensure that it’s done as safely as possible. 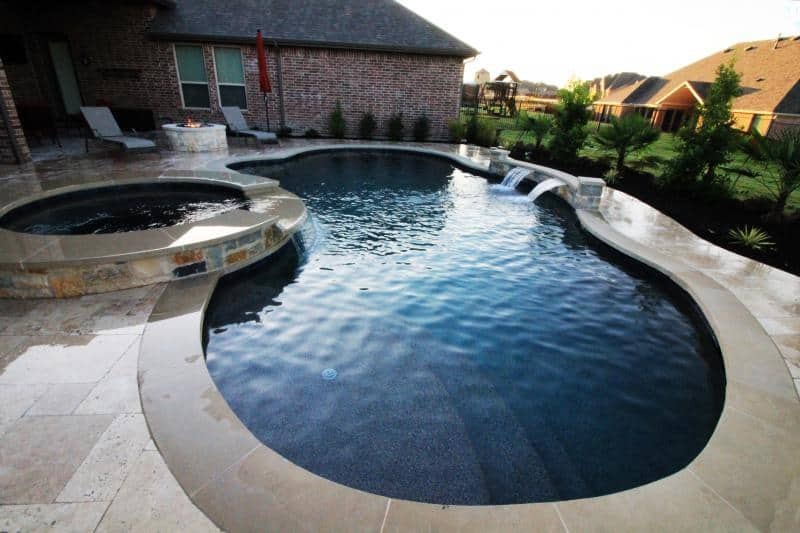 When you hire the experts at Summerhill Pools, you’ll know that you’re getting high-quality service from experienced professionals. Whether you’re interested in a smaller firepit for your family or a large fireplace for an outdoor living area, we can get it installed and ready to work quickly. As a top contractor in Dallas, TX, we have the expertise, skills, and equipment needed to properly design and install your fireplace or fire pit. With our help, you’ll soon be able to enjoy your brand new outdoor fireplace or fire pit. We look forward to assisting you with the selection and installation process. Contact us today and let’s get started!